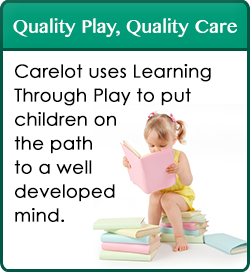 Carelot Children’s Center is committed to providing quality care and education in a warm, secure and loving environment. It is our philosophy that early childhood should be a time of fun, exploration and discovery. Our staff strives to encourage the children we care for to be actively involved in the learning process by providing age appropriate activities. These activities will stimulate and challenge your child according to his/her individual needs. The Center’s purpose is to provide an atmosphere that encourages social, emotional, physical and intellectual growth and development of the child as a whole. In order to achieve this, the children are given the opportunity to learn through play throughout the day. Play and socialization is a vital part of a child’s learning process.